So I wanted to write this post just after I turned 24 so that I would have a year to tick some of these things off my list however that hasn't happen. Four months have passed and the list of things I want to do has finally reached 25 so I thought why not share with you all the things I want to do before I turn 25 which is in 8 months time. Not going to lie, the fact I'm 25 in 8 months is slightly terrifying. Do you ever remember watching films like Father Of The Bride and thinking that 22 was so old and the perfect age to get married?! Oh how times have changed. There are times I wake up and honestly still feel like a 15 year old girl who's yet to find her place in the world. However I then have those days when I look back and realise just how far I have come from being that 15 year old school girl. Things I had hoped to achieve when I was that age have been achieved such as graduating university, finding a job and becoming a little bit more independent. Things that I wanted to do then but couldn't because I was too young can now officially be up to me because I'm now old enough. 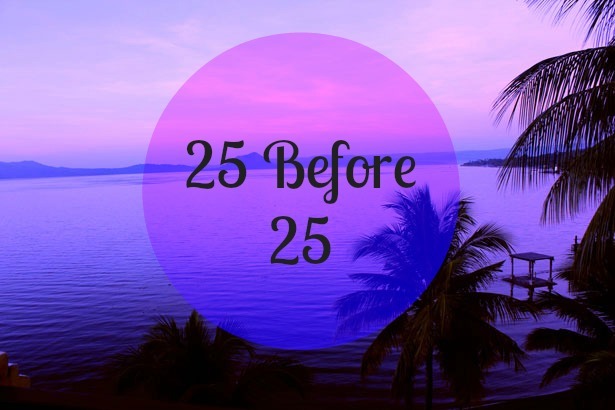 This has been the longest introduction in the world so before I ramble on too much here are 25 things I want and hope to achieve before I turn 25. I've tried to list the things I think will be the most realistic to achieve in the next 8 months. I have so much hope for this year and there's so much I want to happen but it will also be the year I finally start living my life and being happier and doing the things I want to do. The time is now. I'm so young and I need to stop making excuses or saying 'I'll do it tomorrow' as we only get one life and I need to start living mine to the fullest. If there are any things on this list that you hope to do before your next birthday then be sure to let me know. What do you hope to achieve by your next birthday? This is so weird. I'm writing the same post! There's stuff on here I have on my list so we can do together? I really want to go to some blogger events! Good luck with your goals! I'm right there with you. This is a very weird stage of life to be in. I feel like I should be more grown up than I am, but I'm just not. I still feel like high school was last week. I'm actually working on whether I should do a 26 for 26 post or something different (since I did 25 before 25) and my birthday is coming up in less than four months. Time is flying too fast! I hope you can achieve all you want to for your list! Oh my god I love Fathee of the Bride! I feel like no one knows this movie haha! Love your list, in terms of the exercise one, have you tried Zumba?